Yesterday the Spirit of Anzac Centenary Experience travelling exhibition opened in Tamworth. Several members of our committee travelled to see this amazing tribute to those who served during World War 1. At the end of the main exhibition is the Community Zone to which we were invited to contribute photos and artefacts. 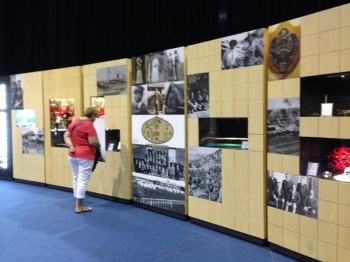 Several photos were submitted for inslusion and the result was we had four of the six panels featuring Inverell district people, along with the DVD of our re-enactmen march. This photo shows Inverell images and artefacts on panels (from the left) 1, 3,4 and 6. The Inverell part of the Community Zone exhibition will only be seen at Tamworth this week. The exhibition then moves on to Toowoomba and Brisbane as it tours Australia for the next 12 months. For further information see the Spirit of Anzac Centenary website.